One area of Azure that I like to highlight in my conversations with companies as an over-looked digital-transformation enabler is DevTest Labs. Microsoft released Azure DevTest Labs on May 2016 but customers have since found many creative uses for it beyond software development and testing environments. 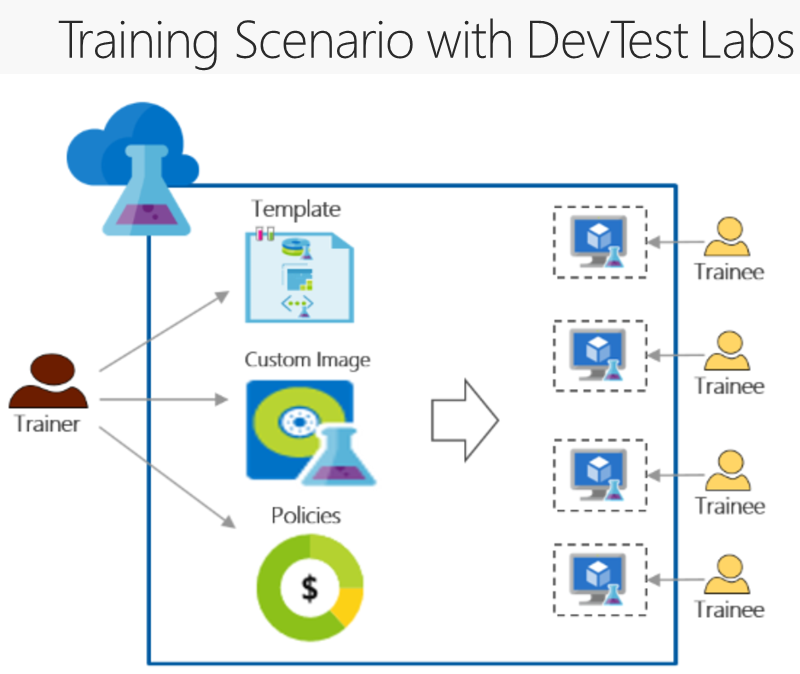 There is no additional cost for the services of DevTest Labs since you are only charged for standard Azure resource consumption such as VMs and storage used in your lab. VMs can be shut-down or started automatically on a schedule (i.e. Monday-Friday from 8:30 AM – 6 PM) to save costs on unused resources. The maximum number of VMs each lab user can own and the VM sizes allowed for VM creation can be set by IT admins to prevent unplanned or excessive consumption of Azure resources. Each DevTest lab is a sandbox for a team to manage their own environments without granting them permissions to access Azure resources or the main Azure subscription account outside of the lab. This means that users only need an acceptable Microsoft account for login to connect to their lab. Charts and projections are provided for IT admins to monitor the total spending and usage as well as set thresholds for alerts and quotas to prevent cost over-runs. You can create multiple labs with the same settings/policies by deploying the same ARM template. DevTest Lab resources (labs, custom images, formulas, artifacts, etc.) 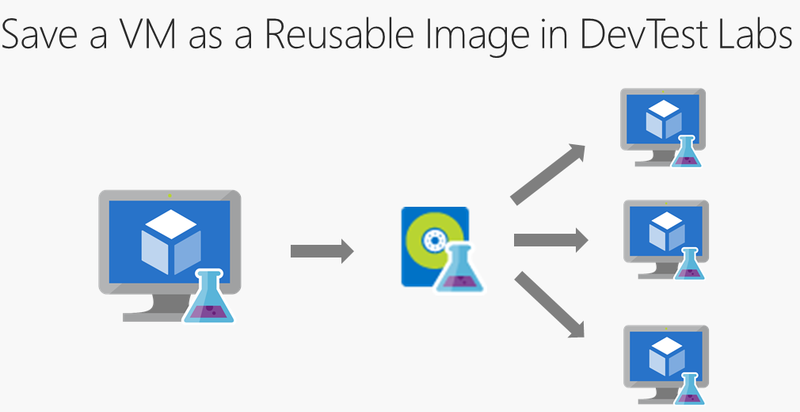 are reusable across labs, so that you don’t need to re-create the same thing from scratch. 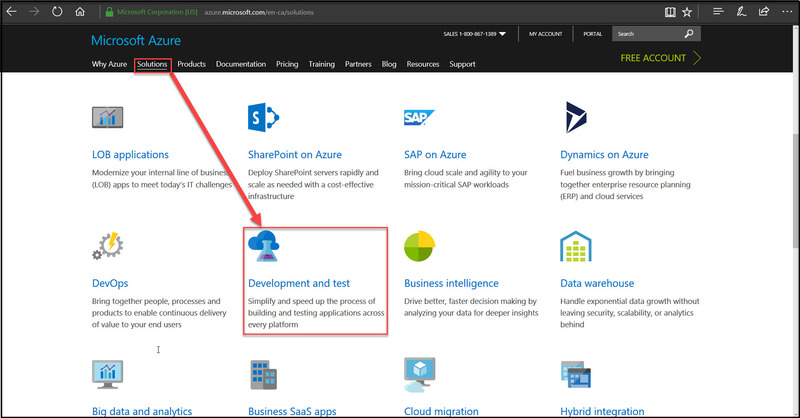 For a quick overview, there is a great 3 minute Microsoft video explaining these 4 ideas at: What is Azure DevTest Labs. Instructors can schedule automatic start-up and shutdown of VMs when the trainees are not using them. Trainees cannot get more VMs or resources than they need for the training requirements. This allows the effective management of training costs and prevents wasted resources. Video: What is Azure DevTest Labs?